We can barely keep up with all the breaking Nick-Saban-cutout news. We were just processing the horrible reports—wondering how to tell the children, really—that a life-size cutout of the Alabama coach was stolen from a Tuscaloosa gas station early this morning. We were roughly two-thirds through Kübler-Ross when word came that cardboard Sabes had been returned, and is back lording over the Diet Dr Pepper. 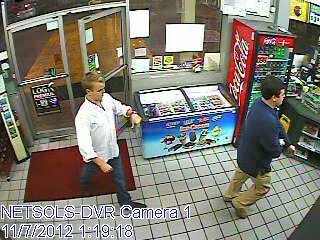 Around 1 a.m., two student-looking fellows strolled in to the BP station on the Strip. They strolled out with the cutout. 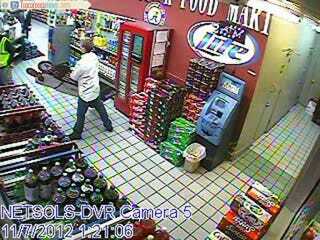 Security cameras got a pretty good look at them. (Check the picture, feel free to narc on them to us.) But when police got involved and asked anyone with information to get in touch, the kids got scared and brought Nick back this afternoon. They apologized to the store owner, but have yet to apologize to America for putting us through 15 hours of terror. "I'm glad to have it back," Rupani said. "This is our pride — it's Nick Saban."